It's been a long time since I had news, so here's an informational update! I've added a control+click feature to insert a terrain without erasing the rest of the cell contents. Also, I'm working on dialogs to edit the properties of individual tiles. Here's a preview: I hope to be able to release a program update with these features in the next couple weeks, so stay tuned. CCLP1 (MS) #79 (ELEVATORS):  (b+1) CCLP1 (Lynx) #79 (ELEVATORS):  (b+1) I can't believe that just happened. Thanks to cowman for playing through CCLP1, and thanks Markus for making SuCC. My first ever b+1 in CC1, and my second b+1 ever. Absolutely insane. Download Hello Chipsters! I am currently working on making a TASing emulator for CC! With this emulator hope to emulate Chips challenge accurately and provide many useful features for routing and even casual playing. Features Rewinding Savestates Frame-by-frame playing TWS Playback Continue recording from playback Easy solution sharing View the monster list, slip list, button connections and chip's move history as you play Record gifs Cheats And much, much more to come! Issues Sliding blocks leaving traps onto sliding tiles cause slide delay when they shouldn't TWS files may end a move early TWS files with clicks may not play back correctly Some unknown issues Currently, 588/596 official levels play correctly. See all known issues. Github repository Feel free to request any features in this thread or by messaging markus#1180 on discord. Chip's Challenge 3 is apparently happening eventually. Here are some improvements from CC2 that I would like to see. Need-to-haves: A sand tile. This would block monsters and blocks but allow Chip and Melinda (with hiking boots?) to cross. There is no tile with these properties in CC2 while even Chuck's Challenge has one. Using fake green walls as a block blocker is awkward. A no-drop tile. An overlay tile that prevents boots from being dropped on it. Blank no signs and no signs with irrelevant tools technically do the job but they are unsightly and don't convey their intent as well as a dedicated tile would. Native support for zero-directional blocks. This is the most commonly used "hacked" tile and is a logical extension of the other directional blocks. Wiring on a separate layer. Wiring in CC2 is powerful, but still held back by their restriction to being placed on just floor and steel walls. The ideal solution is to combine the best of CC1's connection system and CC2's wiring system and allow wires to exist on a dedicated layer. Visibility while playing a level could be toggled by a key and they could appear as a transparent overlay. This would also fix the oddity of pink and black buttons not appearing when hide logic is on. More consistent monster behavior. Bugs and rovers should not avoid canopies. Fireballs and ghosts with flippers should not avoid turtles. Rovers with fire boots should not avoid fire. Support for bowling balls starting on clone machines. The ghost setup takes up an absurd amount of space for such a simple result. Allow blocked green teleports to be skipped over. Support for lowercase letters. Give teeth monsters north-facing tile, and give blue teeth the same number of animation frames as red teeth. Automatic recording while playing a level, like Tile World's. This should be easy to apply to normal play since it already exists in the editor. Higher res graphics, 64x64? No 3D graphics like Puzzle Studio or Chuck's Challenge please Extra green chip/bomb tiles. More diverse sound effects. CC2 has fewer sound effects than the original Lynx game despite the wealth of new elements. Important bug fixes: Disallow hooks from attempting to pull monsters. Disallow the player from being able to slap monsters. If blocks can be pushed consecutively on floor, allow them to be pushed consecutively on force floors. Trap logic fix, including multiple trap button problems and the issues with wired traps Consistent snatching and hook block slapping behavior (i.e. not monster order related) Flame jet max distance fix The two disappearing Chip glitches and the Waterbirth glitch Thin wall on closed side of railroad should not have any effect except when the RR sign is equipped Allow player to step off force floor if they start the level on them Allow key inventory to exceed 255. Want-to-have fun stuff: Allow blocks to be pushed at 2x speed when Chip has speed boots. Make blocks have no effect on recessed walls. This would revert their behavior back to CC1. Ice blocks and directional blocks would still be able to be pushed on them, and turtles could still retain the CC2 "flicking" behavior. More thin tiles: walls are the only tiles to have thin versions of them even though other tiles could be adapted to this concept. Puzzle Studio has thin toggle walls. Thin gravel, thin force floors, thin recessed walls, etc. have potential. Lasers: Puzzle Studio and Escape have these. A beam it shot in one (or more) directions until stopped by a wall and other elements like blocks and perhaps monsters. Chip dies when hit by the beam. Maybe a beam receiver that converts the beam to an electrical current. Reflectors: Chuck's Challenge has these, though they apply to the spitter enemy. Pushable block that reflects bowling balls and lasers 90 degrees. Could be rotated with train tracks. Logic gate enhancements: Add NOR and XNOR gate for completeness. Add diodes which allow current in only one direction, the ability to specify a delay in frames from 1-10, which will make synchronizing circuits easier and remove the need for chained OR gates (Circuit City contains an example of long OR gate chains) "Frictionless" blocks (don't have a better name): Copy of the yellow blocks from Escape. These are blocks, once pushed in some direction, that continue on a straight path until they hit an obstacle. Think of tanks but pushable in any direction by Chip. Score gate: Exists in Challengo, essentially a socket that the player can open if they have enough points but will deduct from their score. CC1 (MS) #41 (I.C. YOU): 172 (b) #56 (DEEPFREEZE): 162 (b) #69 (BOUNCE CITY): 229 (b) #70 (NIGHTMARE): 136 (b) #79 (DRAW AND QUARTERED): 220 (b) #88 (SPIRALS): 317 (b) #90 (PLAYHOUSE): 318 (b) #92 (VORTEX): 444 (b) #96 (PARANOIA): 320 (b) #100 (COLONY):  (b) #104 (JAILER): 235 (b) #105 (SHORT CIRCUIT): 255 (b) #106 (KABLAM):  (b) #108 (BLOCK OUT): 278 (b) #130 (ICE CUBE):  (b) #137 (GOLDKEY): 392 (b) #139 (YORKHOUSE):  (b) CC1 (Lynx) #39 (GLUT): 17 (b) CC1 (Steam) #72 (REVERSE ALLEY):  (b) CCLP1 (MS) #25 (MIND LOCK): 139 (b) CCLP1 (Lynx) #25 (MIND LOCK): 138 (b) CCLP2 (MS) #98 (LOOP): 38 (bc) CCLP2 (Lynx) #5 (SUCTION RIDE): 371 (b) CCLP3 (MS) #37 (BLUE MOON): 135 (b) CCLP3 (Lynx) #37 (BLUE MOON): 129 (b) CCLP4 (MS) #91 (HOW TO RETUNE YOUR HARP): 472 (b) CCLP4 (Lynx) #19 (CONSERVATION OF KEYS): 186 (b) CC2 #146 (BARRICADE BRIGADE): 34 (+2,b) 73340 (+20,b) 16 CC1 bolds (Completing "The James List"), 1 CC1 lynx bolds, 1 CC1 steam bold, 1 CCLP1 ms bold, 1 CCLP1 lynx bold, 1 CCLP2 bold confirm, 1 CCLXP2 bold, 1 CCLP3 MS bold, 1 CCLP3 Lynx bold, 1 CCLP4 MS bold, 1 CCLP4 Lynx bold, 1 CC2 bold. 27 bolds on report Reason for reporting: Sick loop confirm. One strange thing about being away from participating in the CC level design scene consistently for several years is that returning to the editor doesn't quite feel as natural as riding a bike for the first time in several years. Design trends shift; even the way people play the game somewhat shifts as well. The last time I made a 149-level set, it was around the time CCLP1 was being produced. I created JBLP1 as something of a reactionary response to my previous level design efforts that made the cut for CCLP3. With that set's high difficulty, perhaps something easier was in order, and it certainly helped that the community was producing a level pack that seemed to be assembled with many similar sentiments at the forefront. Between then and now, we've seen three official set releases, one for an entirely new-to-us CC game, one a Lynx-compatible version of CCLP2, and the fairly diverse CCLP4, which saw many of the design trends seen in CCLP1 evolved a bit further. So with all of that as part of the community's history, and with many designers trying to find their voice in the world of CC2 design, it seemed like as good a time as any for CC1 design to experience a bit of experimental renaissance as well. Perhaps not everything had to be a crowd-pleasing medium-weight level, or a neatly symmetrical design, though those certainly have their place. But there was still that element of where to even start with respect to design. That's when the latest level design trend offered a solution: the Walls Of level. Although Joshua Bone's Walls of CC1 (built for CC2) was the first to begin construction as a full reimplementation of an official level pack, Jeffrey Bardon's Walls of CCLP4 was the first such reimplementation to be fully completed. As a collective whole, CCLP4's walls offered some of the most open-ended redesign opportunities of any official set, and Jeffrey exercised a lot of care in ensuring that he built in concepts that complemented the layouts with which he worked while also giving them a distinct personality of their own. After recording a full Let's Play of Walls of CCLP4, I was energized to begin construction on my own full Walls Of set. CCLP1 felt like the next best thing, and arguably more than CCLP4, it provided a decently wide range of level sizes in addition to wall patterns. If anything, I knew building an entire set out of an official set's walls would stretch me as a designer in ways I wasn't used to, and force me to embrace unconventionality that I wasn't normally so quick to embrace. The first level, Miniature Overture, was built on April 18, 2018, somewhat as a shoutout to Jeffrey's set opening with a layout from an Archie Pusaka level. From there, The Manhattan Project, Open Circuit, and Crown Jewels were built within that one night, and the rest of the set took off from there. Many of the most difficult levels were made within the first third of the set being built, which helped define some degree of expectation of what the difficulty curve could look like (certainly steeper than CCLP4). I took a break after building the 60th level, Just Passing Through, but would return to the editor in September while on a business trip to construct the next stretch of 20 levels, starting with Every Bomb Has a Silver Lining after I thought about building a spiritual successor to Color Coordination. After building level 80, Chip! In! Spaaaace!, I took another hiatus to focus on optimizing, but later came back in the new year to build the remaining 69 levels within an eight-week sprint, starting with A Mine Is a Terrible Thing to Waste and ending with Manaan on February 28, 2019. Looking back, I'm thankful for the various opportunities to get out of my design comfort zone. I probably wouldn't have had the idea for, say, You Break It, You Buy It if I didn't have Present Company to work with. Half the challenges in When One Door Closes probably wouldn't exist if Utter Clutter wasn't such a tightly constructed set of walls that inspired outside-the-box thinking. And the unusual layout of Booster Shots pushed me to use a palette of tiles in some fun ways to create Slick Slimy Slurpee. Every challenging layout crossed off the list felt like a personal triumph and urged me to keep pressing on and continue designing, and I'm so grateful for that. Overall, I'm fairly happy with how the set turned out! A few notes on the distribution: this download contains a .zip file with three versions of the set, much like Josh Lee's Walls of CCLP3 (which was also inspired by Jeffrey's set as well!). The "unlabeled," vanilla version, Walls_of_CCLP1.dat, is the intended way to play through the levels and is ordered mostly by difficulty. Walls_of_CCLP1_A.dat is the "wall order," in which all the levels are ordered by where their originating counterparts appeared in CCLP1. Finally, Walls_of_CCLP1_B.dat is the "design order," in which all the levels are ordered by when their first version was completed. Most updates from this point forward will more than likely be minor. Enjoy playing, and be sure to leave a comment! I'd love to hear your thoughts. CC1 (MS) 089: 402 (+2, b) [Block Buster] 5,977,370 (137 bolds) Some stats... I attempted this a lot a couple years ago, during my initial CC1 push. I had 0 successful green keys (on pace) but managed to get it once after a couple hours and played out the level for a 387. My score stayed there until yesterday. I grinded for about 2 hours and didn't get the green key at all, but through careful analysis of the 402 video, I was able to slowly but surely figure out common mistakes and avoid them. Then I got the green key and immediately messed up the second room. A while later, I'd gotten more green keys, bu no second room successes. Then I got one that was a move behind- died at third room. Then I got one on pace that ran into a wall immediately after the 4D. That was discouraging. What wasn't discouraging was the fact that I was starting to get the green key much more often, so losing attempts past it didn't hurt as much. Then I finally reached the last room on 402 pace... and immediately missed the first block intercept. I played it out and ended up with a 385, which didn't even improve. A few green keys later, I got back... and missed the final half wait. Day 1: Green Keys: 35 Second Rooms: 12 (6, 12, 16, 19, 21, 24, 27, 28, 30, 31, 33, 35) (bolded numbers oofed after 4D) (italics is technically a fail) Third Rooms: 7 (16, 21, 24, 27, 30, 31, 35) Fourth Rooms: 0 After that set of attempts, I wanted to keep going, but my hand was too fatigued to get the DDDUULUR chain at the end at this point, so I stopped for the night. The next morning I tried for another hour, and after 2 consecutive failures to the DULUR to get the second block at the end, I took a pause. I'd been inputting at full speed and thinking I was going too slow. But a quick analysis showed that it was actually DUL (small pause) UR! With that gotcha realized, I had a few other boosting mistakes on the last 2 blocks, but I was consistent enough at getting to the end that it hardly mattered. I even got to the last 2 blocks on two consecutive attempts! Day 2: Green Keys: 17 Second Rooms: 10 (1, 2, 7, 9, 11, 12, 14, 15, 16, 17) Third Rooms: 10 (1, 2, 7, 9, 11, 12, 14, 15, 16, 17) (bolded numbers are 401s that mis-executed the final boosting chain, but were perfect until after the last blockslide) Fourth Rooms: 1 (17) Total green keys to success: 52. Total successful second rooms: 22 (yeah, 30 failures on the half waits and UU[1/2]UU stuff, + 4 5D instead of 4D) Total attempts at the last room: 17. After various Discord discussions, here are the final level submission rules. I've mirrored this in the original post in this topic: Obvious criteria: no unsolvable levels, no busted levels, no levels that have appeared in any official level pack before, no blatant level mods Level content: It has been decided that no contents other than those listed above will restrict a level from being accepted into voting. CC1 boot levels, zero directional blocks, blank no signs, any misc hex edited tiles, hide logic, and inaccessible bonuses are allowed. Viewport, RNG setting, and map size can be anything. No preliminary bans were put it effect since these levels are in the minority and the voting results will better gauge community interest in these types of levels. Level solutions: MUST be provided. This is mostly to reduce time staff spends testing submitting levels (which, I know from CCLP1 and CCLP4, takes a while). If you are having technical troubles recording solutions to your levels, we can accommodate. What to submit: Your submissions need only be C2M files. C2G files are not required and are not even encouraged. Levels will be jumbled during the voting process and the final pack assembly so C2G files are unnecessary. This also means advanced scripting (level warps, inventory setting, etc.) are implicitly banned since they aren't contained within a C2M file. 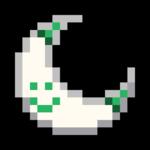 cclp2: #37 (The Mystery of the Seven Chips): 324 (+2, b) #111 (Monster Factory): 376 (+1, b) #142 (Chomper Romp): 520 (+2, b) #146 (Run-a-Muck): 319 (+2, b) 6050980 public tws updated. CC1 (MS) 127: 454 (+1, b) [Skelzie] 5,977,570 (142 bolds) Finally. CC1 (MS) #4 (LESSON 4): 116 (b) #5 (LESSON 5): 85 (b) #6 (LESSON 6): 94 (b) #7 (LESSON 7): 139 (b) #8 (LESSON 8): 96 (b) #9 (NUTS AND BOLTS): 306 (b) #10 (BRUSHFIRE): 51 (b) #11 (TRINITY): 211 (b) #13 (SOUTHPOLE):  (b) #14 (TELEBLOCK): 204 (b) #15 (ELEMENTARY): 89 (b) #16 (CELLBLOCKED):  (b) #17 (NICE DAY): 83 (b) #19 (DIGGER): 171 (b) #21 (ICEBERG): 119 (b) #22 (FORCED ENTRY): 293 (b) #26 (CHCHCHIPS): 254 (b) #27 (GO WITH THE FLOW): 147 (b) #31 (KNOT): 6 (b) #34 (CYPHER): 297 (b) #35 (LEMMINGS): 577 (b) #36 (LADDER): 232 (b) #38 (SAMPLER): 462 (b) #39 (GLUT): 17 (b) #40 (FLOORGASBORG): 195 (b) #42 (BEWARE OF BUG): 187 (b) #43 (LOCK BLOCK): 126 (b) #45 (MONSTER LAB): 292 (b) #46 (THREE DOORS): 222 (b) #48 (MUGGER SQUARE): 277 (b) #49 (PROBLEMS): 162 (b) #50 (DIGDIRT): 318 (b) #52 (THE LAST LAUGH): 382 (b) #53 (TRAFFIC COP): 478 (b) #54 (GRAIL): 326 (b) #55 (POTPOURRI): 70 (b) #58 (LOOP AROUND): 550 (b) #59 (HIDDEN DANGER): 368 (b) #60 (SCOUNDREL): 288 (b) #62 (SLO MO): 282 (b) #63 (BLOCK FACTORY): 477 (b) #64 (SPOOKS): 548 (b) #66 (VICTIM): 292 (b) #72 (REVERSE ALLEY):  (b) #74 (PLAYTIME): 359 (b) #75 (STEAM): 479 (b) #77 (INVINCIBLE CHAMPION): 481 (b) #78 (FORCE SQUARE): 480 (b) #80 (VANISHING ACT): 733 (b) #82 (SOCIALIST ACTION): 969 (b) #84 (WARS): 580 (b) #85 (TELENET): 236 (b) #86 (SUICIDE): 381 (b) #91 (JUMPING SWARM): 367 (b) #94 (NOW YOU SEE IT):  (b) #95 (FOUR SQUARE): 335 (b) #97 (METASTABLE TO CHAOS): 290 (b) #98 (SHRINKING): 338 (b) #99 (CATACOMBS): 380 (b) #102 (ICEHOUSE): 177 (b) #107 (BALLS O FIRE): 260 (b) #109 (TORTURECHAMBER): 133 (b) #111 (TIME LAPSE):  (b) #112 (FORTUNE FAVORS THE):  (b) #113 (OPEN QUESTION): 462 (b) #114 (DECEPTION): 172 (b) #117 (THE MARSH):  (b) #118 (MISS DIRECTION): 260 (b) #119 (SLIDE STEP): 210 (b) #121 (PERFECT MATCH):  (b) #122 (KEEP TRYING): 272 (b) #123 (THE PRISONER): 272 (b) #129 (LOBSTER TRAP): 286 (b) #131 (TOTALLY UNFAIR): 26 (b) #135 (TRUST ME): 293 (b) #140 (ICEDEATH): 263 (b) #141 (UNDERGROUND):  (b) #142 (PENTAGRAM):  (b) #145 (Thanks to…):  (b) #147 (FORCE FIELD):  (b) #149 (SPECIAL): 955 (b) CC1 (Lynx) #4 (LESSON 4): 116 (b) #5 (LESSON 5): 84 (b) #6 (LESSON 6): 93 (b) #7 (LESSON 7): 135 (b) #8 (LESSON 8): 96 (b) #10 (BRUSHFIRE): 51 (b) #11 (TRINITY): 204 (b) #13 (SOUTHPOLE): 981 (b) #31 (KNOT): 3 (b) #45 (MONSTER LAB): 286 (b) CC1 (Steam) #45 (MONSTER LAB): 286 (b) CCLP1 (MS) #3 (PRESENT COMPANY): 183 (b) #4 (BLOCK PARTY): 207 (b) #6 (WHEN INSECTS ATTACK): 185 (b) #7 (UNDER PRESSURE): 185 (b) #13 (THE MONSTER CAGES): 263 (b) CCLP1 (Lynx) #3 (PRESENT COMPANY): 183 (b) CCLP2 (MS) #13 (THE SERIAL PORT): 342 (b) #143 (TRAPPED): 495 (b) CCLP2 (Lynx) #13 (THE SERIAL PORT): 337 (b) #15 (DEBUG FILE): 234 (b) CCLP3 (MS) #114 (LEAD US NOT INTO TEMPTATION): 579 (b) Local man goes streaking through internet forum, and accidentally dumps load of scores. 81 cc1 ms bolds (top 30 ms bold count! ), 10 cc1 lynx bolds, 1 cc1 steam bold, 5 cclp1 ms bolds, 1 cclp1 lynx bold, 2 cclp2 ms bolds, 2 cclp2 lynx bolds, and 1 cclp3 ms bold (lunit LUL) for a grand total of 103. Reason for reporting: Top 30 MS bold count and so that I can use the fortune cookie feature! CCLP4 (MS) #3 (Fossilized Snow): 208 (+4) #5 (Non-Dimensional Layer): 253 (+19) #6 (Proving Grounds): 305 (+3) #13 (Encased in Carbonite): 198 (+3) #14 (Poly-Gone): 302 (+37) #32 (Blended Brussels Sprouts): 299 (+1) #45 (Seven-Layer Salad): 331 (+8) #46 (Exclusive Or): 239 (+1) #47 (Antidisruptive Caves): 337 (+9) #48 (Key Insight): 277 (+1) #49 (Block Parking):  (+15) #50 (Secret Underground Society): 292 (+25) #53 (Protect Your Fortress): 275 (+2) #54 (Split Path): 205 (+13) #62 (Block Unpuzzle): 283 (+46) #67 (Nuclear Energy for Dummies): 303 (+4) #68 (Cold Fusion Reactor):  (+1) #82 (Puzzle Box):  (+2) #83 (Frozen Over): 432 (+8) #84 (Forsythia): 387 (+1) #86 (Cyprus): 307 (+25) #89 (Diametric Opposition): 380 (+32) #97 (Lockdown): 264 (+1, b) #101 (Condo Management): 411 (+5) #102 (The Key Issue): 304 (+1) #105 (Living Things): 407 (+1) #109 (Shemozzle): 21 (+3) #116 (They're Not Called Blocks for Nothing): 267 (+2) #117 (Greenian Motion): 256 (+1) #118 (Chip Controls): 398 (+2) #128 (Mindless Self-Indulgence): 487 (+29) #138 (Zipper): 427 (+12) #144 (Paradigm Shift): 637 (+6) Total Score: 6,074,860 All these except Split Path and Lockdown were improvements made in my CCLP4 LP last year and just never got around to reporting them until now. I know a lot of them are dumb but oh well. @quiznos00 Have you considered cross-posting this to the Steam discussion boards for CC2? Hellllllo everyone, it's time for another Create Competition! Like the last one I ran where I wanted a maze, this time your prompt is also just a type of level. I want a block themed level! There are a lot of interesting things you can do with blocks and many tiles also complement blocks well, so hopefully we get some interesting puzzles out of this. Guidelines: 1. The level should be new, at the very least I shouldn't have seen it before. 2. Other sections are okay, but the focus should be on blocks. 3. The level can be large, or long, but I value compact clever puzzles highly over an overly drawn out level. If it has a reason to fill the whole map or take up many minutes, that's fine, but don't feel compelled to fill up the entire map. 4. I'd like to see a sokoban (push blocks to destination tiles) in each entry that uses a mechanic that makes the puzzle only* work in CC. As a guideline, if you could make the puzzle in YASC, it probably won't do well here. This isn't a requirement, but it'd have to be a very good level to win without one of these. 5. The level can be made in CC1 or CC2, and if CC1, it must be solvable in MS and/or Lynx. I'm aware that CC2 has multiple different kinds of blocks and many other interacting tiles that allows for a lot more potential here, but levels in both games will have a good chance. Recall that the winning maze level was CC2 but almost 100% transferable to Lynx, and second place was MS+Lynx. 6. The deadline is May 3rd, 11:59 PM or whenever I post the submitted levels, whichever is later. I'll give feedback on any obvious busts or flaws I see when submitted, but otherwise won't be giving thoughts until judging. 7. Submit your levels (limit 3) to either my Discord (IHNN#3459) or email ( jbardonjr [at] charter [dot] net). For an example of the sort of level that would do well here, Construct-a-Sokoban uses chips and sockets to make a novel sardine can, while Same Game uses CC elements sparingly to craft a masterful puzzle. Josh's Trick or Trap uses recessed walls to up the difficulty of an otherwise simple puzzle, and his Prison Hall uses force floors to create an elegant puzzle. Block Plaza (in WoCCLP4) uses blue walls to make a guiding puzzle, to use one of my own levels. For a level that wouldn't do so well, pick anything in SokobanCCLP for not using CC mechanics, or Traps II from CCLP2, or pretty much any of Tyler's adapted sokobans (MSI excepted for using toggle walls), and so on. And most importantly, have fun with it! SET/RESET: The outer four buttons can be 'set' independently, and the middle button resets them all. SEPARATE ON/OFF: A simpler version of SET/RESET. Basically like a toggle switch except the on and off functions are separated. MULTI-TOGGLE: You can add more branches as needed. Each press of the button moves the toggle to the next state. EDGE TRIGGERS: The STEP ON trigger fires a 1-tick pulse on tick t+1 after the button is pressed. The STEP OFF trigger fires a 1-tick pulse on tick t+3 after the button is released. The ROCKER fires either a 1-tick or 2-tick pulse on tick t+1 after the button is pressed, and another 1-tick or 2-tick pulse on tick t+1 after the button is released (the pulse will be 1-tick wide for a short press of the button, and 2-ticks wide for a long press). All downloads in the download section on cczone currently seem to be affected by a script injection violating the same-origin policy! This means either the site is currently compromised by a virus or a serious bug in the client side code: The sanitized origin of the attack is s3.amazonaws.com. Edit: Since the whole site is running on amazon simple storage service via cloudfront it's most likely a bug in the sites code, not using the correct uri. Yep, it's that time again, where a designer puts some record of their thoughts about their levels for everyone else to read. Today I'm going to be talking about Ultimate Chip 6, which contains 60 levels and will probably not be updated for quite a while to come. So let's dive right in! 1. Welcome to the 21st Century This was one of the first levels I put together after the time trial designs, and the goal was to craft a simple itemswapper with a very sprawling feeling to it. Does it feel like something that would have been made around the time CCLP2 was made? Possibly- but the design still has the modern touches of no rooms or hallways being diagonally adjacent. That's something that I personally don't like the look of in most cases, and that's why this level curls back in on itself. In hindsight, it's not the best introductory level for this set, but I didn't really have a better one, and I'm not unhappy with it as it shows that UC6 can and will contain... whatever I felt like throwing in. 2. Quantum Tunneling After Miika ran a mini TT with his own level, Twice the Fun, I decided I liked running through the upper ball corridor, especially with how the balls would bounce off to always allow passage if the first was survived. So I went with that on a smaller scale, added a bunch of bombs and a force floor slide to give the balls a second purpose, and had an easy level that was pretty fun to play. 3. Snowball Mountain Back to back ice aesthetic levels! I tend to use ice and force floors a lot in my designs, and also have an aversion to large empty spaces (that I'm working on, thankfully). Anyway, this level was originally conceived as a maze TT level, but it proved too easy to route. Level name borrowed from Ape Escape 2, continuing the trend of monkey game named ice themed levels after UC3's Frosty Retreat, UC4's Hot Springs, and UC5's Snowy Mammoth. Unfortunately, I'm out of Ape Escape ice levels without monkey puns in the name for the future! 4. Repetitive Repetition I had just watched the Game Maker's Toolkit episode on Hitman and the art of repetition, and had the thought- what if I could turn that into a CC level? That's kind of what optimizing already does, but how can I capture that feeling to create an entire level around it? Then the concept kind of morphed into "hey, let's make the same room 3 times but with minor variations that allow shortcuts lol" and it's not that good of a level. However, I've since re-used this repeated room idea to make a much better level that very few people have seen- I'll release it eventually guys, but for now, James says it's super legit. 5. Key Free The original idea here was a puzzle level where you'd alternate sides taking keys and boots and having to move several objects around in a multi-stage puzzle. Then I couldn't figure out how to begin designing such a puzzle and still don't have a clue (concept is up for grabs! ), so around Thanksgiving I sat down at a relatives' house and threw this together. One of Tyler or Shane got tripped up by this level, surprisingly. It's pretty easy with a load of extra keys, but as a little optimizing bonus it's possible to end with the fire boots on the left side, saving some time. Honestly, that little tidbit is why this level stayed in its current form- I added a decent amount of little bonuses for the attentive in this set, and I'll point them out in these musings. 6. Sneaking in the Back Door Ahhh, this level. When I set out to build this level, I knew I wanted it to be rotationally symmetric and on an island, but beyond that I didn't have too much of an idea. Then I decided to place chips with a lock on one side, and a bomb on the other. 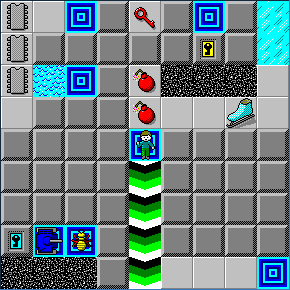 This led to adding a teeth monster in order to skip a key, and the original design had 2 of each key and 1 teeth, requiring 0 teeth bombs. Then I changed it to 4 teeth and 1 of each key, and wasn't sure which version was better, as this was meant to be a fairly easy level. Mostly thanks to Miika's suggestion, I took a third option of 3 teeth (better symmetry at the start!) and 1 of each key, requiring 3 back door entries. You do have to be a little careful, but it's still not too difficult. 7. Tonberry Estates Walls from Key Farming, was entered in the Walls of CCLP1 create competition. Again, I'm mentioning Miika, but I'm sorry- that sokoban is clever and fits perfectly in the room. Oftentimes teleport sokobans revolved around partial posts, so I set out to build one that was non-trivial in that space and used the teleports as alternate loops. The rest of the level is some simple itemswapping, dodging and chip collecting, before some semi-blind fireball manipulations with a toggle button. I went through great pains to keep this part from being cookable, and I think I succeeded- though if you're not careful with the locks used earlier, you can render the fireball stuck. Don't do that. 8. Encased, Just In Case Oh look, a Time Trial level! This sort of chip collecting romp isn't too interesting to just play, but routing it was actually quite interesting. The original version of the level had recessed walls instead of red and blue obstacles, which would have created easier shortcuts but ultimately been less interesting. Other than that, there's not much to say here. 9. Tunnel Boring Machine I do like monster manipulation challenges quite a bit, and this level is nothing but a monster manipulation challenge, albeit a very lenient one with respect to monsters. You only need 8 or 9 total I think, and there are 16 in the level. That said, the dirt involved is a limited resource that has to be used somewhat carefully in order to access the central chips. Some will probably find this level boring (insert rimshot here) but I liked playing it in testing and still think it's a fun level- takes a little thought, but not full focus. 10. Tesla Foil Josh mentioned a concept about unmaking partial posts, so I tried my hand at building a level like that. Unfortunately, teleports can be pretty broken and the level is irredeemably busted. Despite this, the intended path is pretty interesting, using symmetry in design but distinct rooms to keep a theme going without overstaying its welcome. Oh and the ending has been described as "what" and "bonkers", even though it's just a toggle door path Even with the bust, this is one of my favorites from the set. Now I see why Andrew has done his designer commentary in groups of 10 levels. Must upstage everyone though- onwards to another... 5. 11. Red, Brown and Red Another time trial level, this time with a cloning theme and obviously inspired by Red, Green and Blue. Optimizing cloning is very difficult, as it generally devolves into chaos and just trying everything. My goal with this and the other level was to craft a cloning level based around ideas and specific smaller scale collisions, rather than spamming the button and hoping everything works. Did it work here? For the most part- the toggle door at the end was the trickiest part to try to route, and a solution one second faster than my 90% logical solution exists. When I was optimizing this (as I did so before the competition to ensure the process was reasonable) I identified a timing that would clear out the lowest bombs, and then tried a few variations with the spare moves I had until I found one that was fast. As a casual level, it's okay, borrowing more from Four Plex without the toggle buttons. Slightly tedious perhaps, but not uninteresting, thankfully. 12. Primordial Ooze Mazes with force floor walls have become slightly overdone in recent times- Forced Circuit by Josh, Jungle Fever by J.B., Cluttered Crosswalks and Bisection by me... these all do different things with the core concept, but ultimately are mazes where the walls aren't always walls. In this level, named after the second level of Ape Escape, I didn't really do anything to spice up the force floor sections. However, the water mazes I took advantage of the fact that they're water and added a few blocks to bridge to otherwise unreachable areas, adding a small thinking element to the maze. A few toggle doors to take advantage of the force floors later, and I had a symmetric chip placement maze that's actually pretty fun to play. The time limit is 280 because my time attack time is 2.80, though this will be dropping about .05 soon 13. Transmission After You Can't Teach an Old Frog New Tricks came onto the scene, full level monster guidance puzzles have almost universally been difficult, with Andrew's One Tank's Adventure being the easiest. Others that come to mind are Guiding Light (me), Set-up (Shane), Get the Ball Rolling (J.B.) and A Bug's Life (me), using most of the monsters in the game. I'd even tried making a level like this before I'd played OFNT that featured a blob, titled... A Boy and His Blob in UC2. However, that left a gap in easy guidance levels, and the humble paramecia is often forgotten, so I elected to change that. Side note- gliders and walkers still need this kind of level, unless there is one for either of them that I'm unaware of. Anyway, this level has another one of those bonuses for the attentive- there's no chip socket, as the chips were a last minute addition to try to trick people into doing extra steps. The dirt section can be done from either direction, the toggle and tank rooms require active attention (and setting up the tank room was a pain) and the ice room has been complained about, but it can be set up in advance or you can actually move the blocks with the paramecia chasing you! Yes, it's possible! 14. Interdependent Line Walls from Eddy's Honey Bomb, found in NSG-Rejects. This one was honestly inspired by The Witness, in a weird sort of way. There's nothing too out of the ordinary here, just a key ordering puzzle with a simple gotcha, a recessed wall section outlining some gravel, and luring a teeth through half the level to gain access to the exit. The means of exiting was something I'd specifically wanted to use for a little while, and the socket being only the first step out of several was another common design trope I wanted to avoid. Yep, UC6 as a whole looks at conventional design decisions, uses them for the most part, but the moment they became inconvenient I ignored them... which wasn't often. 15. Crazy Box LOL walker level. I still think Hysteria from UC5 is my best walker dodging level, but come on- it's practically mandatory to include one of these.